Even a small dent on your car’s body can totally ruin its look. Overall body of the car, especially doors can often get scratches and scrapes in public parking areas, during harsh weather, and on roads too. Scratches or small dents easily come to notice. So how do you go about repairing these small car dents? Do it yourself dent repair is a good option and many car owners prefer using it in case of very small dents and scratches. It is cost effective than a professional dent repair service every time. However, only perfectly finished DIY repair would give back your car its previous look. 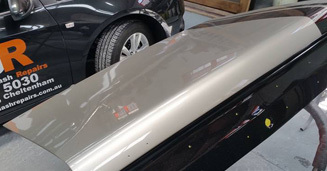 Some car owners consider dent repairs only because they want their cars to look nice and presentable always; while some people consider it as a regular car body maintenance process. Even a small dent that exposes the base metal of the car body can become a reason for rusting. Thus, it’s critical how you approach the issue; do you decide to repair it on your own or prefer approaching a professional repairer? Well, that depends on the severity and location of the dent, and how much paint has been lost. A small sized, less severe dent can be repaired on your own. You would find a number of references for DIY dent repairs on Internet. They include dent repair tools and filler. If you don’t finish the dent repair properly, your car may not end up restored to its original look. Thus, if you are not confident enough to carry out the DIY repairs, it’s better to approach a professional who specializes in dent and paint repairs. Bayside Smash Repairs is a leading smash repairs Moorabbin centre and offers excellent dent repairs as well as paint protection services.